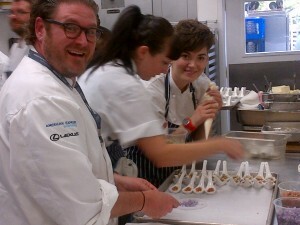 Chef David LeFevre, of Manhattan Beach, directs the kitchen action backstage at Pebble Beach Food + Wine. Just across the hall, master chef Jacques Pepin, who cooked for three French presidents, was putting on a similar show, and eschewing measuring cups to rely on his five decades of culinary experience. His daughter Claudine, acting as both sous-chef and sidekick, swigged champagne in response to her father’s comic eccentricities and rumbling French accent. Pebble Beach Food + Wine co-founder David Bernahl sipping Dom Perignon with American Express Publishing CEO Ed Kelly. 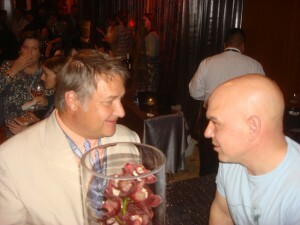 Michael Patrick Shiels with Food Network Iron Chef Michael Symon, owner of Detroit's "Roast," at opening night tasting at Pebble Beach Food + Wine. 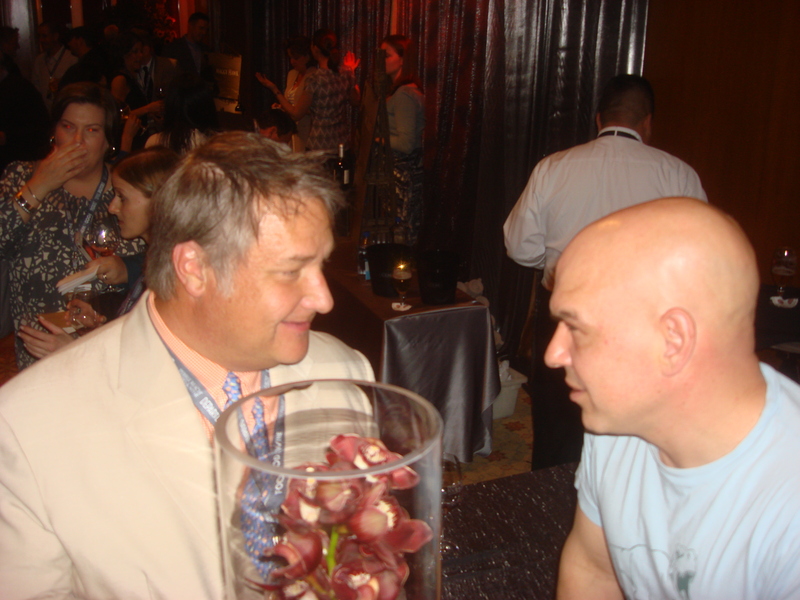 The mingling continued between sips from over 250 wineries including Silver Oak, Caymus, and the Chateau’s Lafitte and Rothschild. 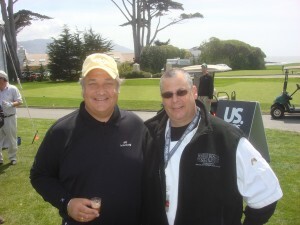 Sharing a swing or a taste with foodie heroes Daniel Boulud, Anne Burrell, Michael Chiarello, and even “Diners, Drive-In’s and Dive’s” host Guy Fieri was par for the course at Pebble Beach. For instance, in small talk on the golf course during the Celebrity Chef and Winemaker Tournament, Andre Bienvenu, executive chef at Joe’s Stone Crab, explained to me the historic Miami Beach restaurant actually owns a fleet of 42 boats to harvest the crab claws. Michael Patrick Shiels on Pebble Beach Golf Links with Andre Bienvenu, executive chef for Miami's Joe's Stone Crab Restaurant. Book quickly to meet stars, though! 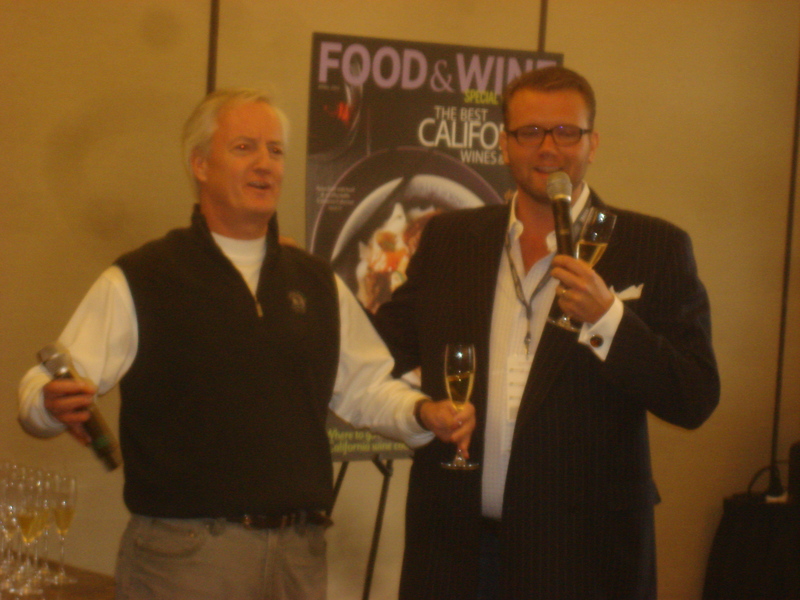 Varying ticket and lodging packages for April 4-7, 2013, will be in high demand when they are revealed at PebbleBeachFoodAndWine.com.